This free application is quite special. It can hide all windows applications that are running on your screen. For that, useless to stop the application! Hide Window Hotkey protects your sensitive information from praying eyes. It is designed by Elongsoft Software. Hide Windows: Hide Window Hotkey has the out of the ordinary task to hide any application window thanks to the use of a mouse hotkey or a keyboard hotkey. And when a window program is being hidden, the app can also silent their sounds. It is also possible to hide taskbar as well as desktop icons. Password-protected: if a user is trying to open the windows being hidden, this won’t be possible. The fact is that, Hide Window Hotkey password protect any window it hide. Information displayed: during the process, Hide Window Hotkey’s interface can display you some information related to the application. For instance, you can have the window handle, class name, process ID and many more. 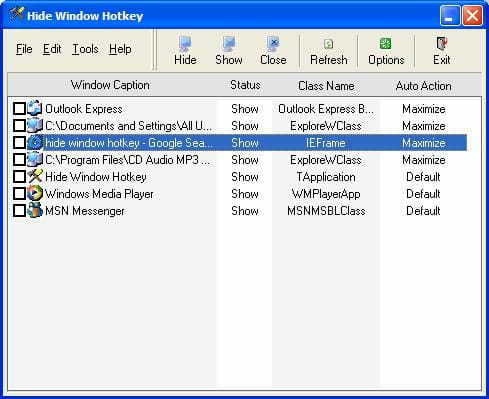 Customization: Hide Window Hotkey enables users to customize hotkeys to access to the windows, maximize or minimize the current window system tray depending on their requirements. Hide Window Hotkey is handy and entirely free of charge. It has a minimized interface to facilitate its handling. Latest update on July 5, 2013 at 06:08 AM.